In 1992, I won the Little Scorpion Trophy, given for most improvement, and I should have stopped then. I trudged on for four more seasons. My plan was to go back when my kids were out of school, but I thought it was time to review the options for today’s Long Island Sound winter sailing. The origins of frostbiting are hotly debated. Larchmont Yacht Club claims to have invented this form of winter “extreme sailing” with its newly Olin Stephens-designed Interclub dinghy. The folklore is frostbiting started in 1932 as a bar bet at Larchmont YC on New Years Day, 1932. According to Gregory Jones’ history The American Sailboat, the race actually came off at the Knickerbocker YC, across the Sound on Long Island’s Manhasset Bay. The original year for Larchmont’s fleet racing, according to documents attributed to the LYC fleet historian, was 1936 and 11 boats sailed that season. 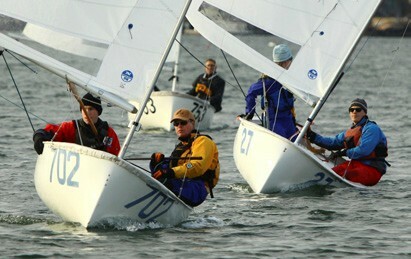 Larchmont starts its season on the heels of the offshore racing schedule, which ends in October. 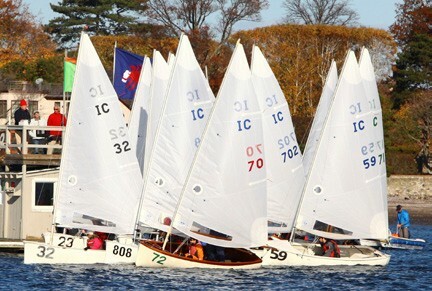 Before Halloween, the IC fleet is on the water. I’ve always considered Larchmont’s setup the Rolls Royce of programs. Boats are kept in a covered pavilion – aptly called the Pandemonium – and carried down to the floats to launch by a team of hired boat carriers. The Race Committee platform, the grey-clapboarded Scorpion, is like no other RC vessel known to racers; the current model sports an upper deck where Nick Langone, head of Winter Sailing, runs his races. The Scorpion is comfortably equipped with a stove, and well provisioned with snacks and beverages. With racing conducted inside the reach of the Larchmont breakwater, sailors are well protected from easterlies and the frequent northerlies. There was no need to fire up the iron pot-bellied stove on the December Sunday that I went out on the Scorpion, with record temperatures in the 60s with 8-10 knots from 60 degrees. “Is there any better way to spend an afternoon?” was Nick’s comment on the day. Sailors on 29 boats, including an array of white fiberglass models and just half a handful of woodies, enjoyed seven races in near ideal conditions. The new look of Larchmont’s starting and finishing shack is a rooftop deck from which Nick directs traffic. Start signals are done with Istart, a shoebox-sized bundle of electronics topped with a silver horn. Dial in the starting program and it’s off to the races. The new look in the fleet features plenty of female skippers and a new selection of junior sailors honing their skills on one of the most competitive starting lines in America. The fleet is divided into A, B and C divisions, with additional scoring for Master and Women skippers. The early competition pitted Peter Ferrarone in #74 and Ward Young in #27, battling with veteran Andy Kaplan with his 30-year-old #75, local Viper ace Peter Bauer in #702 and perpetual competitor Paul Jean Patin in an ancient O’Day-built craft, #17. I counted more than a dozen family crews, father-child the most common pairing. Getting off the line with almost 30 boats jostling along a relatively long starting line is the key to getting into a sailable lane. Early on, boats were splitting to the corners, with the right hand boats playing a slight south flowing current. With four or five minutes for a weather leg, followed by a seven- to eight-minute run and a three-minute beat back to the Scorpion, committing to a lane and avoiding excess tacking are crucial. Downwind, the new high-tech innovation is a notched wooden paddle for the crew to keep the boom out with the skipper on the rail creating weather heel to reduce wetted surface. The finishes were frenetic, with Nick Langone’s daughter Pier Witek and Cynthia Parthemos, a Larchmont Race Committee veteran, writing down the finish calls. They didn’t miss a boat in seven races. I was treated to a leeward mark view of the action aboard Howie McMichael’s Puff. Howie is an accomplished photographer, and the LYC Winter Sailing website has plenty of fantastic shots for all to enjoy. We finished the day with only one boat in the water, an embarrassed top echelon Viper sailor who somehow turned upside down early in the run of race 5. By the time of the final race, a crew race for eight eager competitors, the sun was truly low in the west. We hopped off the Scorpion into a launch for the ride in, with the feeling of a good day’s race committee work. It was two weeks into January when I attempted to complete another segment of my tour, with the Mamaroneck Frostbite Association. 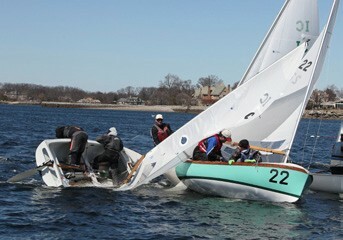 Paul Beaudin, the head of Doyle’s loft on City Island and a top J/105 skipper, had offered to get me into an extra boat. Boats sit on the Beach Point YC docks on the west side of the opening of Mamaroneck Harbor. Howie McMichael said the Mamaroneck Frostbite Association was started by a trio including his father, Bus Mosbacher of 1962 America’s Cup fame, and Warner Wilcox, who sailed into his 90s. Today, according to Beaudin, who has dominated the A group during his five years, there are over 50 members. One unique feature is the fleet’s maintaining of a dozen charter boats to encourage prospects to get out and give it a try. The RC usually runs eight races a day. Over 20 weeks, that’s an awesome number of potential races, and the competition is friendly. The venue for most of the years has been the opening of Mamaroneck Harbor, with Hen Island to the south and Mamaroneck Yacht and Tennis Club with its Stanford White clubhouse to the north. 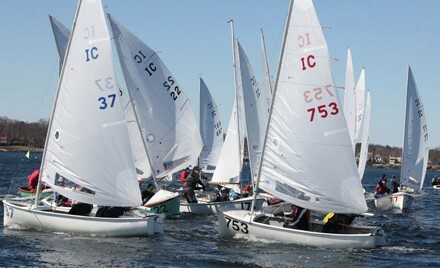 With the exception of diverting to New Rochelle one season after Sandy took down Beach Point YC, the racecourse, as at Larchmont, has been a constant, with its mix of local winds, currents and water conditions. The big difference at MFA is that it involves solo sailing in the Dyer 9 – 100 pounds of sturdy, old-style laid up fiberglass, built for generations at the Anchorage in Warren, RI. The Dyer 9, known to many as the Dyer Dhow and a tender for legions of cruising sailors, is slightly modified with an aluminum mast replacing the original two-piece spruce mast. There are regular and high wind sails, allowing these midget racers to go in winds over 15 knots. As Beaudin said, the practical wind limit is how far aft one can sit downwind and keep the boat from nosediving. I was geared up for the Dyer, having bought new gloves and sorted out my frostbite clothing layering. I was to go to a briefing at 11 am before the 12 pm dock date to learn the handling secrets of this miniscule dinghy. I had been told by a fellow sailor, who stands well over six feet tall, “Stick your feet out the side, and get on your knees downwind. I anticipated and brought construction worker’s knee protection. Alas, I woke up that Sunday with 30-knot easterlies driving rain at my living room window. Racing was cancelled for the day, as much for rain as for wind; frostbiters need visibility. Maybe next time. My apologies to all the programs I wasn’t able to visit, especially Riverside YC in Riverside, CT, alleged to have the region’s largest fleet in its parking lot – more than 40 Dyer 10s. Maybe next year.